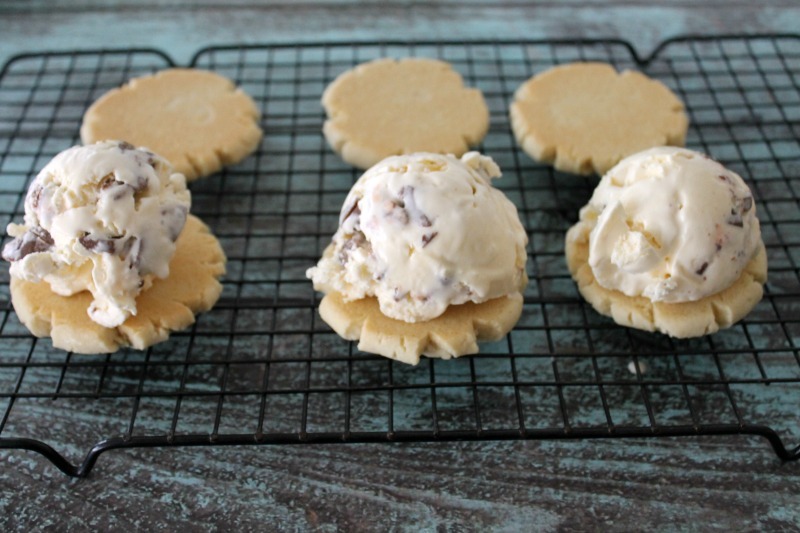 Get your Easter candy fix with one bite of my Cadbury Creme Egg Ice Cream Sandwiches! Two types of candy eggs pair together with ice cream and cookies are a kid’s dream, no matter how old. My boys love Easter, and this year they’re both finally old enough to dye eggs and get down to some serious Easter fun! Most years we go over to my dad’s house and all the cousins have a huge egg hunt together. I’m talking 7 kids and 150+ plastic eggs filled with all kinds of treats. It’s a blast and I swear the eggs never stop popping up somewhere. In the spring Arizona is on the warm side. While other parts of the country are thawing, we’re running around in shorts and t-shirts in 85+ degree weather. 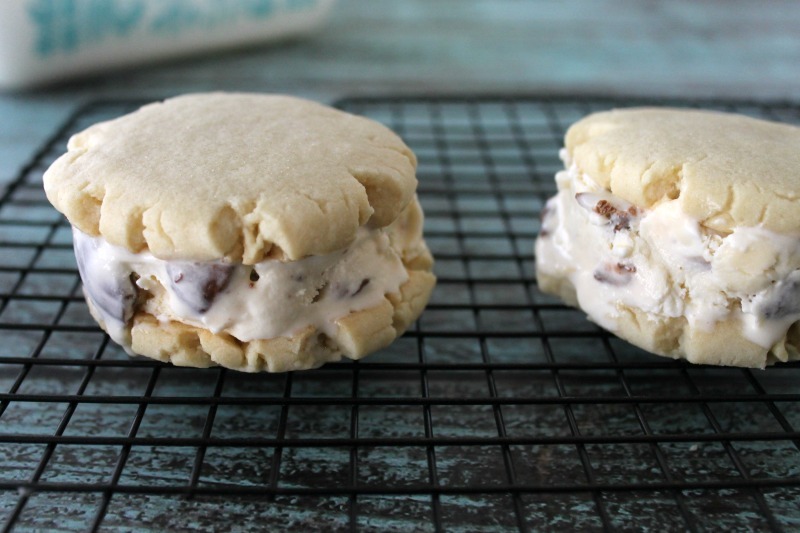 One of our favorite ways to cool down when it’s warm is an ice cream sandwich. They’re fun, they’re a little messy, and I have yet to meet a kid that doesn’t love them! 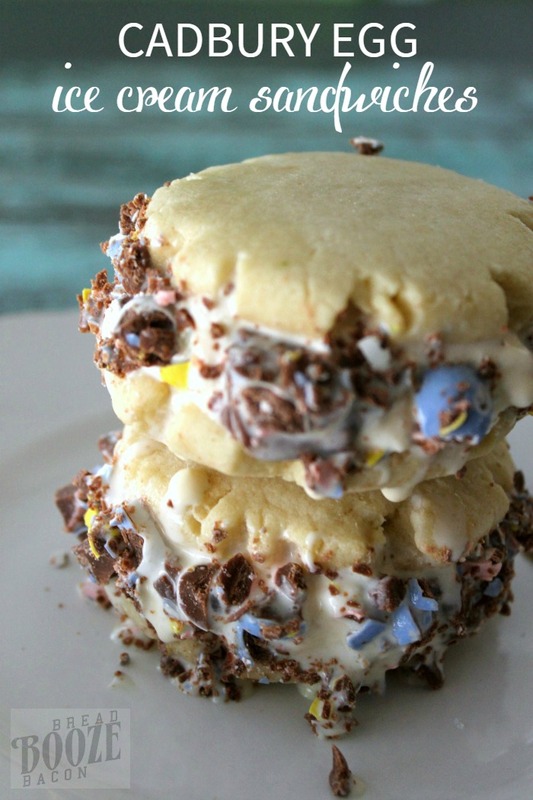 So this year for Easter, I’m surprising the kids with Cadbury Creme Egg Ice Cream Sandwiches. They have all of my favorite Easter candies in one cool sweet bite! Your eyes are not deceiving you kids. I just chopped the best, most yummy Cadbury Creme Egg Candy, and mixed it in with ice cream. Yeah. It’s amazing! I think next time I’m going to skip the semi-homemade route and make ice cream from scratch. That way the cream from the egg candy won’t harden up until after it’s swirled in. Mmmmmm. But the semi-homemade way is awesome and billion times easier. I’ve been obsessed with Cadbury Creme Egg Candy for years. Like decades people. They’re one of my all time favorite Hershey candies, and definitely my most coveted since they’re not available year round. How can you not love the insanely good Hersheys chocolate (I’m Hershey’s for life!) wrapped around a center of gooey, sweet happiness?! HEAVEN! But why stop at one egg, when you can have two? That’s right, we’re chopping up Cadbury Mini Egg Candies to coat the ice cream edge of the sandwich. Now, the pieces you’re seeing up in that picture are NOT small enough. I did the chopping by hand, and had a “that’s look good enough” moment. Wrong! Pop your eggs in the food processor and pulse them, or keep on chopping! You don’t want chocolate powder, but your want the pieces pretty small so they stick to the ice cream easily. Then assemble your ice cream sandwiches! I made cookies from scratch, but you could totally pick up some cookies from your grocery store’s bakery to save time. If you make homemade cookies, chill them in the fridge so they are stronger when you sandwich them around the ice cream. 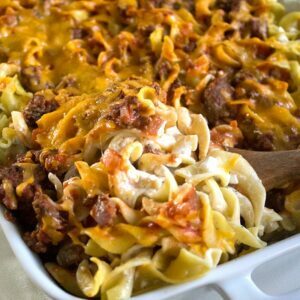 These babies are SO easy to make and the kids will flip for them. Be sure to work quickly so your ice cream doesn’t get to melty. Then wrap the ice cream sandwiches in plastic wrap, and pop ’em in the freezer until ready to serve. 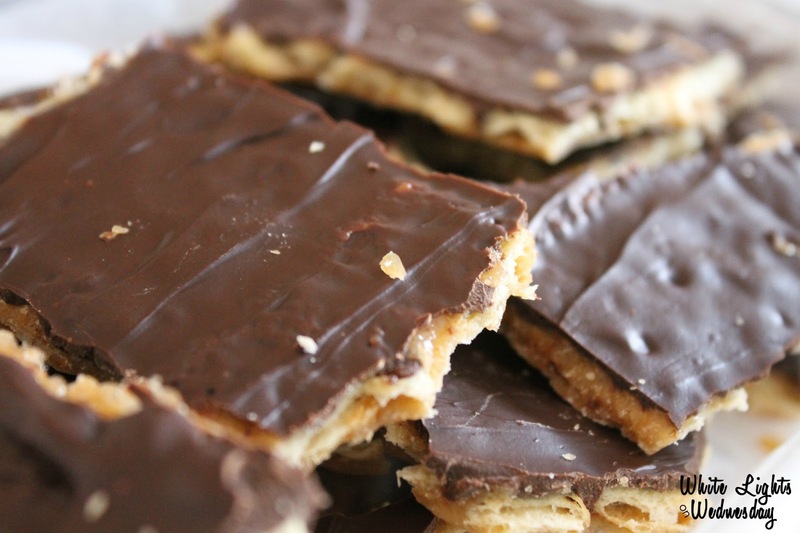 These are a great make ahead treat for your Easter get together! How will you Celebrate with Hershey’s this Easter? You can get more great Hershey’s Easter ideas like this one by following the #HersheysEaster hashtag! 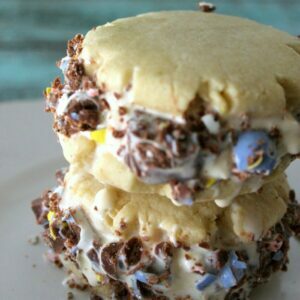 Get the Easter candy fix you crave with one bite of my Cadbury Egg Ice Cream Sandwiches! Two types of candy eggs pair together with ice cream and cookies are a kid's dream, no matter how old. Remove ice cream from freezer, and set on counter for 15 to 20 minutes, or until ice cream has begun to thaw and is easily scooped from the container. 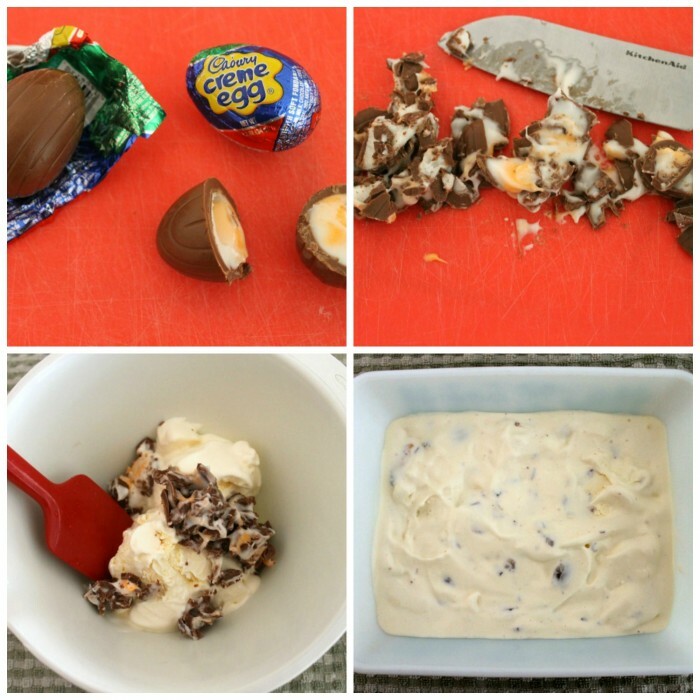 Unwrap, and chop Cadbury Creme Egg Candy into small pieces. Pour candy pieces into a medium mixing bowl. Be sure to get all the gooey center off the knife and cutting board and into the bowl. Scoop 2 cups of ice cream into the bowl with the chopped candy. Using a plastic spatula, stir candy and ice cream until well combined. Pour ice cream mixture into a rectangular or square 2 quart dish, and spread into an even layer. This is a good time to make sure your candy isn't lumped into one are of the ice cream! Cover the ice cream with plastic wrap, and place the dish in the freezer for at least 30 minutes, or until the ice cream has set up again. 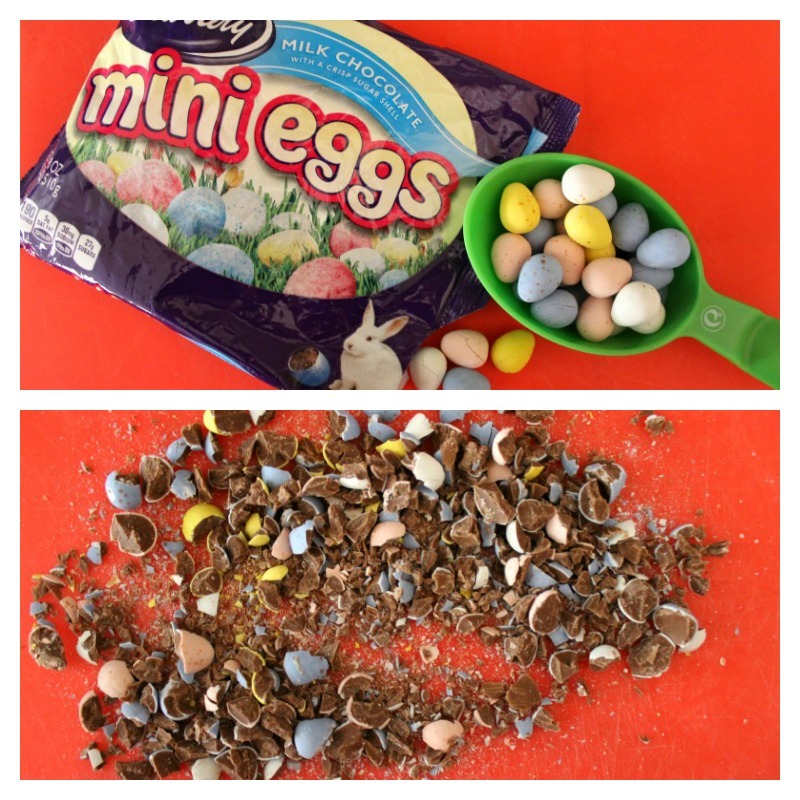 To a food processor, add Cadbury Mini Egg Candies . Pulse candy until it is chopped into fine pieces. You want to be able to see pieces of the candy shell, but not big hunks. Remove ice cream from the freezer, and place diced Cadbury Mini Egg Candies in a shallow bowl wide enough to fit a cookie. Place 4 cookies, bottom up on a plate. Top each cookie bottom with a scoop of your Cadbury Cream Egg ice cream, and then top the ice cream with another cookie (bottom facing the ice cream). Press down on the top of the sandwich until the ice cream reaches the cookie edge. 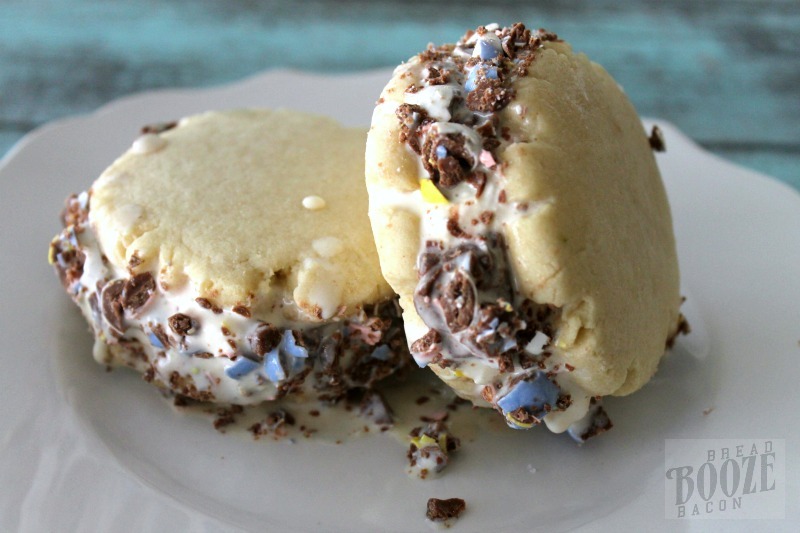 Immediately roll the ice cream edges of the sandwich in the diced Cadbury Mini Egg Candies, turning the sandwich until all the edges are coated. Place sandwich on a dish, and return to the freezer. Repeat with remaining ice cream sandwiches. 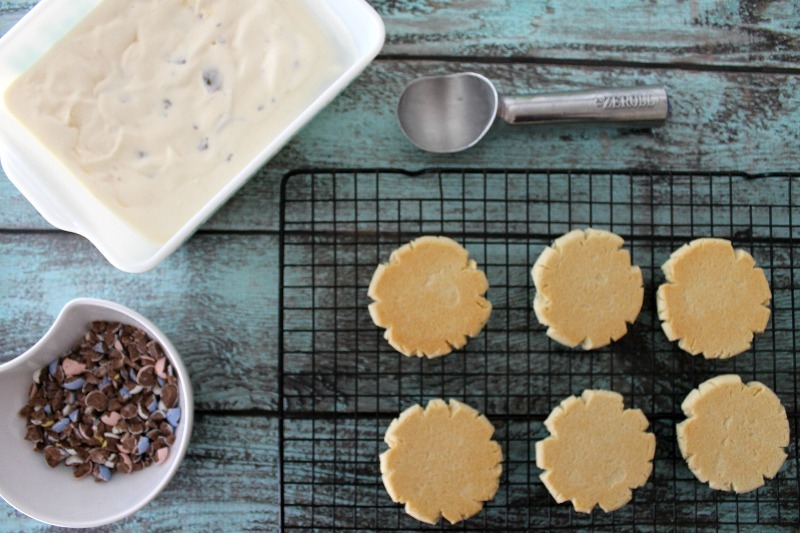 Serve immediately or wrap ice cream sandwiches in plastic wrap until ready to serve! If using the homemade sugar recipe linked to above, prepare dough as instructed. Do not refrigerate dough. Portion 2 tablespoons of dough for each cookie, for each portion into a ball, and then flatten on a Sil-Pat lined baking sheet. Bake at 350 for 11 to 14 minutes, or until bottoms are golden and tops are set. 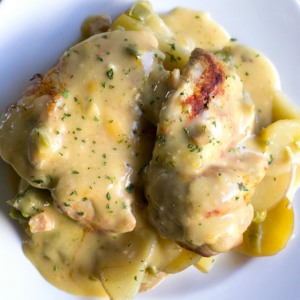 Cool in the refrigerator for at least 30 minutes. Yum! Thank you and have a great weekend! Yum! 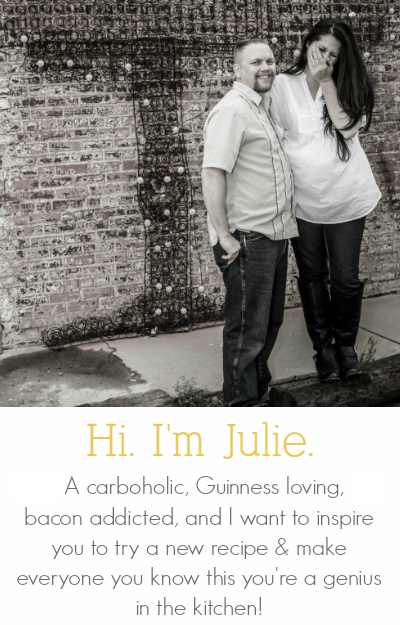 I love Cadbury eggs. My mother brought me a dozen mini eggs because I’m sick. These look tasty!